Posted on January 16, 2011 by Pavel Y.
Angostura bitter is hard available in the Ukraine. But Angostura bitter is essential ingredient of the famous Manhattan. Manhattan is truly magnificient cocktail. As Garry Regan wrote in they The Joy of Mixology Manhattan is King of Cocktail. 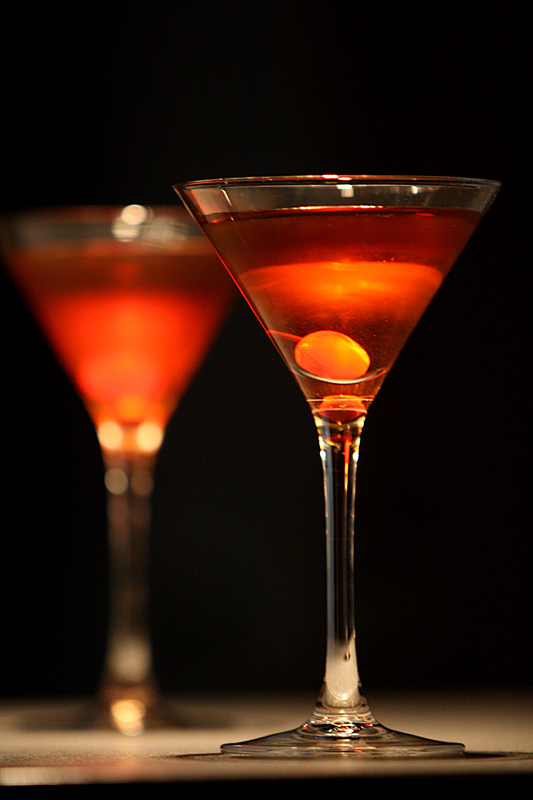 Actually we can make acquaintance with Manhattan with help of two very interesting special variations. The Special Manhattan Cocktail was found at the CocktailDB. It contain Campari Bitter instead Angostura. Stir well with a lot of ice. Strain into chilled cocktail glass. Garnish with cocktail cherry. Actually a proper whiskey in Manhattan are american whiskeys like rye whiskey or bourbon, but you may substitute with canadian whisky with apropriate results. I tasted several combinations with all of my canadian whisky – Canadian Club, Black Velvet and my favorite Crown Roal De Luxe. Also I use two of my sweet vermouths – Martini & Rossi Rosso and Cinzano Rosso. IMHO Martini Rosso vermouth is not great choice for both cocktails. The Cinzano works well in both. The Special Manhattan Cocktail is great man’s drink. It is connoisseur’s choice. This cocktail is too similar to original Manhattan. It is strong bitter sweet and complex cocktail with aromatic profile. The bitternes of this two cocktails are so different. 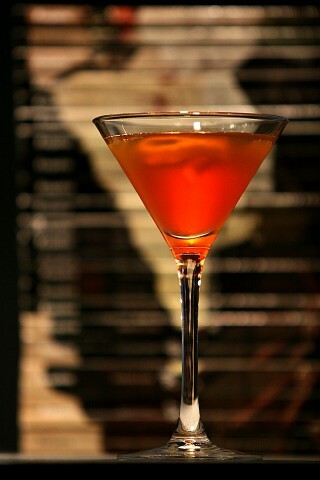 Our next cocktail is Esquire Manhattan. This cocktail was created by D. Wondrich for Manhattan Experience Contest. This Manhattan contain Fernet-Branca instead of Angostura. Stir well with a lot of ice. Strain into chilled cocktail glass and add a orange twist. Original recipe prescribe Woodford Reserve bourbon and Martini & Rossi sweet vermouth. The Esquire Manhattan is great cocktail. It has strong bitter-sweet taste with great bourbon palate. The bitter finish are very interesting with a lot of herbal bitter notes of Fernet-Branca. It is great Manhattan expirience. Манхэттан, конечно, роскошный коктейль. Именно такой, который является мерилом твоей погруженности в коктейльную культуру. С Мартини еще хуже, конечно. Действительно подходящий джин стоит безумных денег, вермутов крайне мало. Но не нужно противопоставлять “попсовый” Мартини и “правильный” Манхэттан. Настоящий Мартини – это еще более рафинированный и “узкий” коктейль – крепкий, горький и сухой. А все фруктовые и сливочные вариации… Разве слово “мартини” в названии делает их настоящим Мартини? Кайзер Пингвин делал Фернет Олд-фешенд: две унции фернет и пару дэш Ангостуры. Прочистка желудка ЖКТ и мозга капитальная. И возможность просмаковать охапку “сена”. Я туда еще капал своего черри-бренди, все-таки сухая вишня отлично вписывается в букет Фернет…. Но все равно, даже креплёный бурбоном вермут и фернет – стоящая комбинация. а ты очень дорого Ангостуру покупаешь? У них она не дешевле. @drohnenton: я, как собственник 4 бутылочек ангостуры (мне ещё одну подарили друзья ;) ), смотрю на рецепт Stormy Mai-Tai с маниакальным блеском в глазах, но тут категорически возражает жена, приводя мне твой, Леша, аргумент. 100 мл там же стоили 450 рублей. то есть это 2600 за 0,7.
скажу, как родным, я ничего дороже 2400 не покупал – ни коньяки, ни виски, ничего. рекорд был Джек Дэниелс Сингл Баррел (2400р). Мой ржаной довольно спокойный на вкус – сухонький, тепленький такой, без буйств и вообще неяркий. А вермуты у нас – ширпотребные: брендовые и/или дешевые. Это очень удручает, больше, чем отсутствие ржи или Лемонхарт-оверпруф, которые через раз мелькают у буржуазных блоггеров. На самом деле, очень трудно судить о виде алкоголя по одному представителю. До того момента как у меня появился ржаной, а именно Дикая Индюшкая, я много раз читал, что ржаной виски – пряный, грубый, мощный, ароматный. Это все полностью соответствует WT. Ну да :) Сначала было все очень понятно: скотч – дымный, ржаной – пряный, канадский – мягкий, а бурбон – вонючий. А теперь… У-у-у… Я знаю, что я ничего не знаю. I’m so glad you wrote up these variations. The Manhattan is one of my most regular cocktails, yet I often forget these easy substitutions to keep them interesting. I have had the “special,” with Campari, and it is a delight, a little bit brighter and fresher than with the Angostura. Your note that Angostura is hard to find in Ukraine stopped me in my tracks. It’s very hard to imagine the cocktail hour without Angostura at hand. Do you have other bitters readily available as a substitute? Jerry Thomas used Boker’s bitters for his Manhattans back in the 1800s, with never a mention of Angostura, so you are in good company if you substitute another bitters and still call your drink a proper Manhattan. I certainly won’t complain. In fact, I think I’ll go make one right now. Actually Angostura is so available in my city now. We have one or two store which offer this bitters. Another bitters (including A. orange) are absolutely unavailable. We have similar situation with another spirits – for example vermouths. But Manhattan is one of my favorite cocktail for long time. I explore recipe such above for new impression from Manhattan. It is so interesting way to improve my Manhattans. Have you tried a Manhattan with Carpano Antica? Unfortunately no. I have heard a lot about Carpano Antica Formula Vermouth, actually. But Carpano products absolutely unavailable in Ukraine now. I still try to order it in some online store or find in duty-free shops. Why is some of this in Russian letters? I’m a big vodka fan, and was wondering just what exactly is: 12 ml Fernet-Branca. Never heard of it.